Fig. 1. (A) Fos-like immunoreactivity in the rat hypothalamic arcuate nucleus following an iv injection of either 100 ^g GHRP-6 in isotonic saline (Top), or an equal volume of isotonic saline vehicle (Bottom). (B) Fos-like immunoreactivity in the supraoptic nucleus of the hypothalamus following injection of either hypertonic saline (top; 1.8 mL/kg body weight of 1.5 M NaCl; ip) or 100 ^g GHRP-6 (bottom; iv injection, dissolved in isotonic saline). Reproduced from ref. 6 with permission. gogue administration (16). 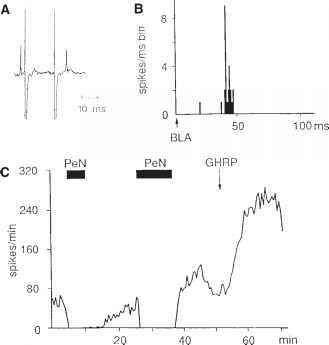 In the authors' electrophysiological studies they demonstrated that GHRP-6 activates a subpopulation of putative neurosecretory neurons in the arcuate nucleus, identified as projecting to the median eminence, some of which fulfilled multiple criteria for identification as GHRH neurons (Fig. 2) (6,17). This appears to be a direct action of GHRP-6 at the arcuate nucleus since arcuate neurons respond to GHRP-6 and related secretagogues in hypothalamic slice preparations where they are disconnected from all but closely adjacent inputs (18,19). Studies in the authors' laboratory and others have recently confirmed that the GH secretagogues activate GHRH neurons. In the arcuate nucleus, c-fos mRNA is induced in a high proportion of GHRH mRNA-containing neurons following injection of GHRP-6 (20) or the peptide GH secretagogue KP-2 (21), though it is also induced in some other subpopulations including, most notably, a proportion of the neurons in the arcuate that express mRNA for neuropeptide Y (20). Currently, it is not known whether activation of neuropeptide Y neurons participates in the neuroendocrine events leading to increased GH secretion following GH secretagogue administration. Since arcuate NPY neurons have been implicated in the regulation of feeding behavior (22), it will be interesting to discover whether activation of this population by GHRP-6 explains the GH secreta-gogue-induced feeding response (23). Fig. 2. Extracellular recordings in vivo from a single arcuate neuron that (A) is antidromically identified as projecting to the median eminence, as demonstrated by the collision of an orthodromic action potential with a antidromic spike, (B) is trans-synaptically excited by electrical stimulation of the basolateral amygdala (BLA), as illustrated in the poststimulus time histogram, and (C) is inhibited during electrical stimulation of the periventricular nucleus (PeN). Following a 10-min period of stimulation, the cell displayed a rebound hyperactivation. Intravenous injection of 100 ¡xg GHRP elicited a large increase in the firing rate of the neuron. Studies employing systemic administration of the retrograde tracer, Fluorogold, indicate that as many as 68-82% of the cells excited by GHRP-6 project outside the blood-brain barrier (24). This finding probably implies that most of the arcuate cells activated by GHRP-6 project to the median eminence and, hence, are likely to be neurosecretory neurons involved directly in the regulation of pituitary function. Conversely, most non-neurosecretory neurons are not activated by GHRP-6, although some have displayed inhibitory responses in the authors' electrophysiological studies in vivo (7) and in vitro (18,19); in particular, the POMC and the somatostatin neurons do not appear to express c-fos mRNA following GHRP-6 injection (20), nor indeed do the periventricular somatostatin neurons. However, it remains possible that GHRP-6 activates arcuate neurons not directly, but indirectly via inhibition of inhibitory interneurons in the arcuate nucleus. Although not all of the cells activated by GHRP-6 are GHRH cells, the neurosecretory identity of most of the cells activated indicates the possibility that other releasing factors, perhaps including an endogenous ligand for the GH secretagogue receptor, are released at the median eminence in response to GHRP-6 and participate in the regulation of pituitary GH release. These characteristics of GHRP-6, that it is a selective secretagogue for GH, acting at highly selective receptors expressed specifically at both hypothalamic and pituitary sites (8) to stimulate GHRH (16) and GH release (1,2), respectively, strongly suggest that GHRP-6 is mimicking an unknown endogenous ligand whose physiological role is specifically concerned with GH secretion. In what physiological circumstances, and through which pathway, might such a ligand act?